The disease manifests as a sudden onset of severe headache, chills, pain upon moving the eyes, and low backache. Painful aching in the legs and joints (myalgias and arthralgias—severe pain that gives it the nick-name break-bone fever or bonecrusher disease) occurs during the first hours of illness. The temperature rises quickly as high as 40° C, with relative low heart rate (bradycardia) and low blood pressure (hypotension). The dengue rash is characteristically bright red petechiae and usually appears first on the lower limbs and the chest (see figure 2). The glands (lymph nodes) in the neck and groin are often swollen. In some patients, it spreads to cover most of the body. There may also be gastritis with some combination of associated abdominal pain, nausea, vomiting, or diarrhea. Some cases develop much milder symptoms which can be misdiagnosed as influenza, chikungunya, or other viral infection when no rash is present. The classic dengue fever lasts about six to seven days, with a smaller peak of fever at the trailing end of the disease (the so-called biphasic pattern). Clinically, the platelet count will drop until the patient's temperature is normal. 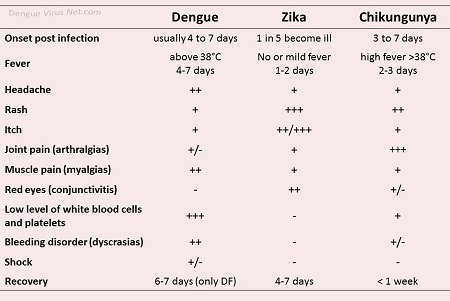 Dengue virus infections are sometimes confused with chikungunya viral infection, because both diseases can present with high temperatures and myalgias (muscle pain) in people living in or returning from tropical areas (see figure 2, and also diagnosis of Dengue and Chikungunya). Although these diseases share similar clinical features, prominent and prolonged joint pains are more consistent with chikungunya, whereas haemorrhage is more common in cases of dengue virus infection.